Perhaps no other breed epitomizes a show dog as much as a poodle in a Continental or Scandinavian clip, but lumping the poodle into a single venue would be to ignore more than 500 years of breeding and working history. The poodle originated in Germany (where it was known as the pudelhund) and was popular throughout Europe – it’s even the national dog of France. It became popular as a pet during the 18th Century, but has a storied history of service. From the battlefield to the duck marsh, the poodle has worked closely with man for hundreds of years – which is probably a reason why it often ranks as one of the most intelligent breeds. Poodles were originally used for retrieving downed waterfowl for hunters. Their dense, tightly curled and water resistant coat helped keep them buoyant and insulated in the cold water. There are kennels throughout the country that are working to continue the hunting heritage of the poodle by training and testing them in hunting venues. 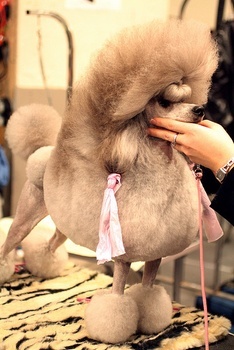 Poodles have also been used since the 17th Century as war dogs, including during World War II as guard dogs. They also compete in obedience, agility, tracking and even herding, as well as in the conformation ring. They are a highly energetic and intelligent breed, so do best in households that can provide interaction, activity and training. If they don’t receive these outlets, poodles, like most dogs, are likely to get into trouble in an effort to relieve boredom. Poodles come in three sizes: standard (over 15 inches at the withers), miniature (between 10 inches to 15 inches) and toy (under 10 inches). It’s believed the standard poodle was the foundation stock for the smaller versions, which were selectively bred for soon after. The toy (often called “teacup”) poodle was developed in 18th Century England when the practice of keeping dogs as pets (as opposed to working animals) became popular. These smaller versions might have been what was referred to as “truffle dogs” – small dogs that used their keen sense of smell to sniff out truffles (an edible fungus considered a delicacy in England, Germany and Spain during the time). Perhaps the most identifiable trait of the poodle is its tightly curled coat. It can span a gamut of colors, ranging from silvers to apricot to black to white, and it can even come in parti-colors (solid-colored patches over a white coat). It’s believed that parti-colored poodles were the original markings of the breed. The poodle's low propensity to produce dander leads many to believe (and market) the dogs, and especially cross-breedings, are hypoallergenic. To be sure, no dog is completely allergen-free, but poodles do tend to produce less dander (likely due to its dense, tightly curled coat) than many other dogs. As one of the older breeds, poodles tend to have several health issues, including Addison's disease, gastric dilatation volvulus (better known as bloat), thyroid problems, tracheal collapse, epilepsy, sebaceous adenitis, juvenile renal disease, hip dysplasia and cancer. At Paw Print Genetics, we offer panel testing for all three breed variations: standard, miniature and toy. Some of the included tests are alopecia, degenerative myelopathy, neonatal encephalopathy with seizures and progressive retinal atrophy, progressive rod-cone degeneration.